Photo above- Easter sunrise service at Beach Rock- 2001 perhaps. 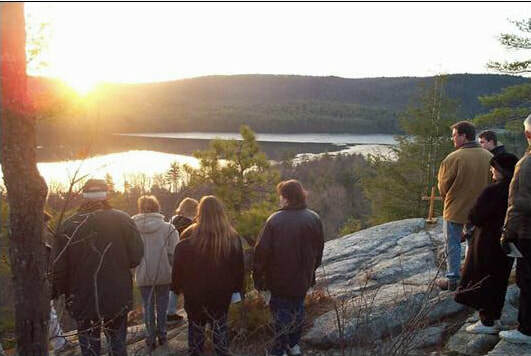 Join us for Easter sunrise service on Sunday, April 21, 2019 at 6:30 am at Beach Rock overlooking the Barkhamsted Reservoir (Beach Rock Road in Barkhamsted). This is a group effort sponsored by several area churches. Immediately after the service come to our church, First Congregational Church of Barkhamsted at 6 Old Town Hall Road (less than a mile from Beach Rock) for breakfast. If the outdoor service is rained out, the service will be held inside, at First Congregational Church of Barkhamsted at 6:30. Hope to see you Easter morning! Our regular April 21, 2019 service will be held at 10:00 am at First Congregational Church of Barkhamsted. Photo above - progress on the final phase of repairs to the church- shingling the roof December 19, 2018. The shingles were completed and other work done by the end of December 2018. We now have a safe roof that does not leak! It has been a long tough journey. Thanks to all who have helped us during this challenge. Our special Sunday service on December 16, 2018 featured the annual church Christmas Pageant. We had very nice attendance and many people taking part in the presentation (see photo below). Great fun, music and a celebration of the birth of Christ. After the service all enjoyed fellowship and a nice pot luck lunch. Photo above- church pageant held during the Sunday service on December 16, 2018. Photo above - progress on the second phase of our roof repairs...workers have put up staging that will be used to access the roof to make repairs on the belfry and to re-shingle the roof. The work is on schedule to be completed by the end of December as long as the weather does not become a major factor. We are excited to introduce our new church organist, Laurie Pont Hall. Laurie started in September 2018 and it is so nice to have her with us and listening to great live music again in church. She is the accompanist for the Connecticut Yankee Chorale. She served as organist for the 2018 summer season of the Church of the Transfiguration in Norfolk. Prior to that she was the organist at the First Congregational Church of Litchfield for 35 years, directed the bell choir, and directed the senior choir as well after being named Music Director in 2008. She and husband David live in Harwinton, and have two adult daughters, Allison and Courtney. Laurie, welcome to our church! In the ongoing fundraising efforts of the church, we held a tag sale on Sunday, October 14 on West River Road in Barkhamsted. We had to move the tag sale up one day because of the rain on Saturday. We had good weather and benefited from the Riverton Fair traffic. We raised $650 which makes it one of the best tag sale results we have seen. Thanks to all who donated items for the sale and helped work at the event. On Sunday, October 14, our church held a special "blessing of the animals" ceremony. The service and ceremony was originally planned to be held outside on the portico of the church, but due to the cold weather it was held inside. The dedication welcomed and honored all varieties of domestic animals in the area, including two goats! Roof framing stabilization repairs have been completed in May and the church has been working on the second phase of the project: re-shingling the roof. Bids for this work and some other repairs have been received and a contractor has been selected. Re-shingling work was supposed to start in mid September 2018, but the contractor is late. Work is still progressing but snow and cold weather have hindered progress, and workers have found more damage and rot in the lower belfry than expected. We still hope that somehow the work can be completed by year end 2018. Because we have some leaks in the roof and with all the rain lately, it will be nice to have new shingles and flashing installed. The church will not need to close for this work, but during the construction period, please use caution when in or around the building. The bills have come in for our expensive roof repairs and we needed to raise funds to cover them and to pay to have the roof re-shingled. So we are had a tag sale fundraising effort on July 6 and July 7 at the town of Barkhamsted highway garage on Route 44 (right near the entrance to the RRDD #1 landfill). It was a lot of work but we raised $743 for the church. Thanks to all who helped! Sunday Services resume at our Church at 6 Old Town Hall Road. Sunday, June 17, 2018 - our first service back at the church since September 2017! It was great to be back home (see photo below). Photo above - Sunday, June 17, 2018 - first church service back in our church sanctuary since September 2017. Church Opens - Building Declared Safe! Structural repairs to the roof framing have now been completed and our engineering firm has provided written documentation that the work has been successful. Today (June 4, 2018) the Barkhamsted building inspector has issued a work completion certificate and has declared the church building safe for occupancy. This is a huge step for us. There is still some work to be done, including new shingles on the roof and flashing to stop leaks. We have applied a coat of stain/preservative to the wood floor of the sanctuary. This staining operation and getting things cleaned up have been completed now, and for the first time since September 2017, we will be BACK HOME for the church service starting June 17, 2018 and for Sundays going forward. Photo above: Church pastor Rev. Susan Wyman and church member Todd Davis remove the "BUILDING UNSAFE" sign from the door of the church (June 3, 2018). Church members Marcy Brandow and Mary Anne Stoecker apply the first coat of stain/preservative to the church floor June 4, 2018. Photo above - work continues on the roof framing upgrade in the "attic" of the church. It may not be readily apparent in this shot, but the scope of the repair work is extensive. Photo taken May 14, 2018. Photo above - sitting in the church sanctuary are some of the steel plates that will be used to reinforce roof framing joints in the attic. Photo taken May 14, 2018. The two photos below show the first day (April 23, 2018) of repair construction on the roof framing of the church building. Workers from the contractor firm Kronenberger & Sons Restoration start actual construction work at the church. How long before the repairs are finished and the church building can open? That's the big question. Surely the construction work on the framing will be done by mid July 2018 and the current estimate is that this work will be done by early June 2018. We are hopeful that the church building will open shortly after. When roof repairs are completed, the engineering firm will inspect and, if all is in order, sign off on the work. Then the town building inspector will review the work. If all is in order, the building will be ready for use. We are not sure when this will all happen, but our hope is by late June or maybe even mid June. The second phase of construction will involve replacing the roof shingles: removing the existing shingles and possibly the roof boards (plywood) and replacing them. We believe this work will start later this summer. We anticipate that the church building will be open and available for use BEFORE the start of this second phase of the project. We get a generous grant! 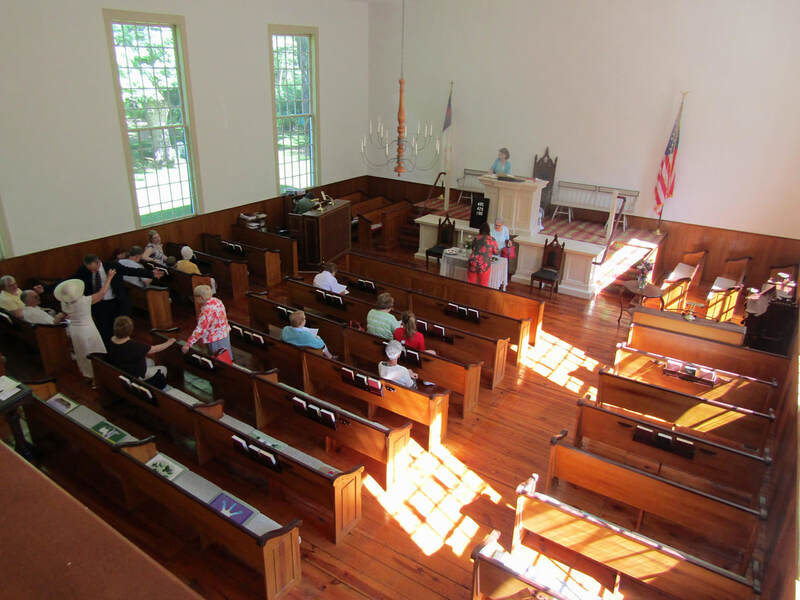 The First Congregational Church of Barkhamsted is pleased to announce that on April 5, 2018 we have received approval for an $18,000 grant from the Eva M. Coty Fund, a fund of the Northwest Connecticut Community Foundation. This grant will cover a portion of our costly and extensive roof repairs. We so appreciate this generous grant from the Foundation. We have been very concerned that roof repair costs could threaten the viability of our church, and this grant helps to alleviate that concern. With this grant and earlier grants from the State Historic Preservation Office of the Department of Economic and Community Development, we can now cover a major portion of the costs. We plan to initiate soon a grass roots capital campaign to request donations from the community, which will also help. The First Congregational Church of Barkhamsted has signed a contract with Kronenberger & Sons Restoration (Middletown, CT) to make repairs on the roof framing at our church building. Preliminary work has started already and the main effort will start in mid April. When the project will be completed we do not know for sure, but we are hopeful that the repairs will be done by mid June. When the repairs are done, we expect that the church building will reopen for use. After the roof stabilization work is completed, we will ask for bids and select a contractor to complete the remaining portion of the project which includes re-shingling the roof, flashing and other work around the belfry and some repairs to our plaster ceiling. We got four bids by the March 12 deadline, reviewed them, got input from our engineering firm and selected the lowest bidder: Kronenberger & Sons Restoration. They are experienced in repair work involving old post and beam framing which is what we have at our church. Because the church is an historic structure, we wanted to preserve as much of the existing framing as possible. One of the early options proposed was completely replacing the roof framing with a modern truss system, but that was rejected because we did not want to completely remove the original framing. The structural stabilization design done by our engineers will keep virtually all the old framing. Partial funding for this project will be provided by a grant from Connecticut’s Historic Restoration Fund through the State Historic Preservation Office of the Department of Economic and Community Development and also by a grant from Eva M. Coty Fund of the Northwest Connecticut Community Foundation (see announcement above). We are very thankful to these two for this support. Unless we get a huge snow storm in April, it appears that we got through the winter without a roof failure caused by snow load. None of the options available to address snow load on the roof were good, but in early December the decision was made to have almost the entire roof covered with a new tarp, this time on both sides of the roof. The goal was to hopefully have the tarp shed snow and also to stop water damage from the leaky roof. On December 8, 2017, the tarp was installed (see photo below). The next day we got about five inches of snow, and within a day or two the snow had been shed from the roof. We realized that the snow would not always come off right after a storm, but we hoped that the slippery tarp would prevent a buildup of snow over several storms, and it did just that. Now (mid April 2018) after several winter storms, the tarp has performed very well, with most of the light snow storms we have received being quickly shed off the tarp on the roof. Photo above - church tarp being installed on the roof on December 8, 2017. Photo above- so far, so good! A couple of days after getting about 5 inches of snow, the blue tarp has no snow on it and the area not covered by the tarp (below the belfry) has snow sticking to the shingles. The structural issues in the roof framing are located from the mid point of the roof and toward the right in this photo (taken December 11, 2017). Our church held its annual meeting at the assembly room of the town highway garage (as you probably know, our church building is unavailable due to roof framing problems). After a nice pizza lunch, reports covering 2017 activities were presented from the pastor, officers and committees. It has been quite a year. The 2018 budget was discussed and adopted. Officers and committees were elected or appointed. A lot of people have worked hard for our church to make it run as smoothly as possible, and we are grateful to all who have given their time and resources. Photo above - church annual meeting January 21, 2018. We had our traditional Christmas pageant on December 17 even though our church building is temporarily closed. The pageant followed a short Sunday service at the town garage assembly hall. We had an excellent turnout and lots of kids playing the roles of angels, animals and other characters of the Nativity. Everyone had fun! Photo at left- our Sunday, October 15, 2017 church service was held on the portico of the church. We cannot use the interior of the building due to roof framing issues. Sunday services have been held at the Senior Center, but we were not able to use the Senior Center this Sunday. Each year during Riverton Fair weekend, the Barkhamsted Seniors have a big tag sale fund raising event and needed the Senior Center building to support that effort. So we had our service back at the church, and fortunately the day was fairly warm and the rain held off. Photo above - Church tag sale on October 14, 2017. With the Riverton Fair drawing a lot of traffic, what better day to hold a tag sale to raise funds for our church? This is the third year we have done a tag sale. The location is on West River Road in Pleasant Valley and a lot of people going to the Riverton Fair stopped in to see what we had for sale. Fortunately the rain held off, and we made $416 for the church. Help us out! Save your tag sale items for next year. We collect stuff all year, so keep us in mind. Today, October 4, 2017, Church restoration committee chairperson Leslie Cosgrove announced that our Church has received preliminary approval of our $50,000 grant application by the State of Connecticut, Department of Economic and Community Development from their Connecticut’s Historic Restoration Fund.” The grant will be formally approved when all the paperwork is completed and signed, which should be done soon. This is a matching grant, so our Church will need to raise at least an additional $50,000 to complete the work. The work involves critical structural framing repairs to the roof of the church building, and also includes other necessary repair work such as re-shingling the roof of the building. The church building has been closed since late August 2017 because of structural deficiencies discovered by engineers hired by the Church to look at the integrity of the building. The work required to fix these issues and to re-shingle the roof of the building and complete some additional tasks is expected to cost a significant amount. The actual cost will not be determined until the proposed work is put out to bid and a contractor's bid is accepted. The process of getting bids and selecting a contractor are the next steps. The Church will need to cover up front 100% of the cost of the project, and the $50,000 grant funds will be paid to the Church after the project is completed. ​On September 17, 2017, our Church held the Sunday service at the Barkhamsted Senior Center on West River Road in Barkhamsted. After the service, a meeting of the Congregation was held at the Senior Center. At that meeting it was decided to continue to hold our 10:00 am Sunday Church services at the Barkhamsted Senior Center for at least the immediate future. Our Church building in Barkhamsted Center cannot be used until roof framing deficiencies are addressed. At the meeting, this effort was also discussed, specifically a need for a fundraising plan and a need to develop options for temporary repairs or permanent repairs as soon as possible. Photo above - meeting of the Congregation on September 17, 2017 at the Barkhamsted Senior Center. ​Old Home Day activities began with the Sunday worship services at 10:00. Because of the roof issues the service was held outside the Church on the Portico. ​Following the service, the traditional group photograph of all participants was taken on the steps of th Church portico. After the service we enjoyed a Pot Luck luncheon...what a nice warm sunny day for all the activities! ​Following the lunch, a we hiked about a half mile down to the west side of the Barkhamsted Reservoir and visited several historic sites including the location of the original meeting house built in 1784 (dismantled just after the Civil War) and the Center schoolhouse and cemetery. Photo above left...the September 10, 2017 "Old Home Day" service held on the step of the Church. Photo above right...the traditional Old Home Day group photo - September 10, 2017. In late August of 2017, the engineering firm GNCB discovered additional structural issues in the Church roof framing and recommended that the building not be occupied until these issues are corrected. Therefore, regular Church worship services will not be held in the Sanctuary until further notice. We very much regret these developments, but in the interest of safety feel we must follow the recommendations of the engineers. Stay tuned here for updates on the location of future worship services. ​Photo at left- our Church. Look closer and you can see a big tan tarp covering part of the roof. We have a leaky roof, and worse- the roof framing has issues. This tarp lasted about a year, now (late 2017) it is pretty much in tatters. In 2016 we hired a structural engineering firm to pinpoint the framing problems. That investigation is now in process. The first recommendation was to make some critical temporary fixes to shore up the problem timbers. This was completed in December 2016 -- just in time to prevent any damage from the winter snow load! This church is an old structure that is on the National Register of Historic Places, so we need to make permanent repairs to the framing that will preserve as much of the building fabric as possible. That goal is what we are currently working on.